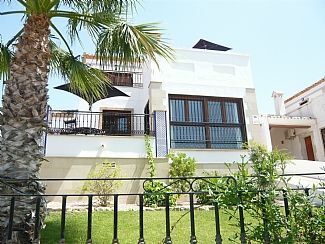 Luxury 3 Bed Villa (sleeps 6) on La Finca Golf Resort - Perfect location! Only a 30 minute drive from Alicante Airport or Murcia Airport, La Finca 5 Star Golf & Spa Resort is situated at the foot of Mount Escoteralies in the town of Algorfa, with natural surroundings of great beauty and fantastic panoramic views. La Finca offers the very best in facilities and luxury, which are open to those who want to play golf in the heart of nature (4 beautiful courses within 20 mins drive of La Finca), whilst being able to enjoy a selection of the wonderful beaches (10 minute drive). The five star hotel, spa and clubhouse host a range of restaurants, events and activities. There are also international restaurants, 2 water parks, casino and nightlife all within easy reach. La Finca itself has many restaurants & bars and a mini supermarket only 3 minutes walk from the Villa. An idyllic place in the sun for my wife and I and our 3 beautiful children. We support a charity by donating a set number of weeks a year at the Villa but we love to give families the chance to experience La Finca. La Finca has the best golf course in this part of Spain with at least 4 other great courses within 25 mins drive. This part of Spain is still unspolit and you get to see the real Spain. However, everything you need is within easy driving distance. The area is beautiful & surrounded by mountains and orange and lemon groves. La Finca is a quiet resort where you can really escape from the rat race. La Finca has a 5 star Hotel on site complete with luxury Spa complex. Our villa is within a few mins walk of the shops and restaurants but far enough away so you don't here a sound. We are also within 30 seconds walk to a beautiful communal pool, but again secluded from any noise. Our back garden has been turned into a large BBQ / entertaining area with beautiful views. For those who are travelling with a young family, we have a high chair, steriliser, travel cot, maclaren buggy, stair gate and toys, as well as plastic cutlery and plates etc. We have a large balcony on the top level, where you have views of the mountains and the golf course. We also have a balcony at the front, which is ideal for supper in the evening and in the back garden we have a beautiful patio area with a large brick barBQ> From here there are stunning views of a castle and the sea. Everything you would want in terms of activities and things to is within a short drive from the villa. You can also make use of the full facilities that the on site 5 star hotel has to offer. The en-suite bathroom has a sink, toilet and walk-in shower The family bathroom has a sink, toilet, bath/shower and bidet. The lounged/dining area has marble flooring throughout, a sofa and armchair, open fire, dining suite for 6, satellite TV, DVD and CD/stereo. There are double doors leading to the rear solarium, with fantastic views of the mountains. In the kitchen is a cooker, oven with ceramic hob, fridge/freezer, toaster, microwave, washing machine, iron and ironing board, highchair and the usual glassware, cutlery, crockery and cooking utensils. La Finca is a golfing oasis situated in picturesque rural surroundings with fantastic views. The course already hosts top tournaments but the Spanish Open is pencilled in within the next few years. Within 20 mins drive are Las Colinas, Campoamor, Las Ramblas and Villa Martin as well as Polaris with 3 more courses. La Manga Resort is 50 mins drive away. La Finca measures over 7000 yards off Championship tees, with a host of sand and water obstacles, and a variety of shaped greens, it is a fantastic test of golf and has the reputation for being Costa Blanca's best golf course now. La Finca Golf Course is around 25 - 30 minutes drive from Alicante airport and 15 minutes drive from the tourist centre of Torrevieja and the superb beaches at Guardamar. Notes on accommodation: The villa is fully air conditioned. It is set up for children with a travel cot, steriliser, highchair, children's cups, plates etc as well as toys. There are numerous inflatables, tennis rackets and board games. Outside: There are garden areas to the front and rear of the villa. At the rear is a large BBQ & dining area. On the bottom balcony at the front of the villa there is a further dining area with sun loungers. There is also rear access to a beautiful large communal swimming pool. There is also private parking on the driveway. Utility Room: There is a range of sports and swimming equipment in the under stairs utility cupboard. Cleaning / Towels / Linen / Maid service: All towels and linen are provided throughout your stay. Welcome Pack service available. For a separate charge we can arrange for maid service during your stay. Other: There are front and rear garden areas. The rear garden overlooks the orange groves, sea and castle, whilst from the front you can see the beautiful Orihuela mountains. For golfers, all you could wish for. For pampering, the on site spa. For beach lovers, the best beaches in Costa Blanca within 10 mins drive. Spa at 5 * hotel. The fabulous beaches of Guadamar and La Zenia are only a 10 minute drive away. Both have EU Blue Flag status and are surrounded by numerous restaurants and bars. They are believed to be the best beaches on the Costa Blanca, receiving many awards for the level of cleanliness, safety and facilities. Alicante airport is 30 mins away, whilst Murcia is a 25 mins drive. Car hire is highly recommended. Algorfa and Los Montesinos (neighbouring towns) - 5 minutes by car. 10 minutes from Guardamar beach and 15 minutes from Torrevieja and Quesada, both are larger towns full of restaurants shops and cafes. Torrevieja has a stunning promenade and marina together with a host of restaurants, including a Hollywood diner, a casino, a water-park, a cinema, an amusement arcade, kids zone, a golf pitch and put, a bowling alley and even Pacha nightclub! The historic town of Orihuela is 9 miles from La Finca and was once the most important in the region. Its many Gothic and baroque buildings make this town a delight for the tourist. For the children a must is Terre Mitica. It is a large theme park near Benidorm (which is one hour away by car). It is themed into different worlds and the rides are fantastic. Unlike Disney, you can find your way around relatively easily and you can cover the entire park in a day. In addition there are aqua parks in Quesada and Torrevieja. Booking Notes: Please contact Brad Luton by telephone/email. brad@cdsr.com or 07977531882 Changeover Day: Changeover days are flexible and there is also flexibility on arrival and departure times depending on availability.